Coraline is one of the best movies I’ve seen in a long time. 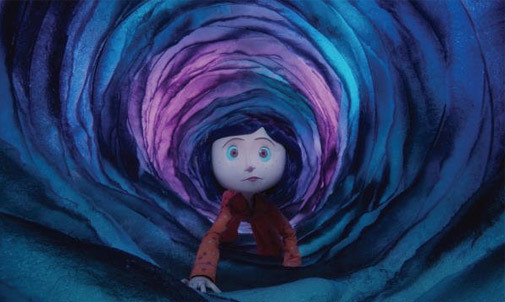 Like the director’s previous animated films, James and the Giant Peach and the beloved The Nightmare Before Christmas, Coraline is an incredible combination of whimsy, creepy, and visual brilliance. This film goes above and beyond the now-ubiquitous Pixar-style computer animation, and impresses with stop motion miniatures. The level of care and minute details add to the film’s transcendence. Everything in the film is hand-made. 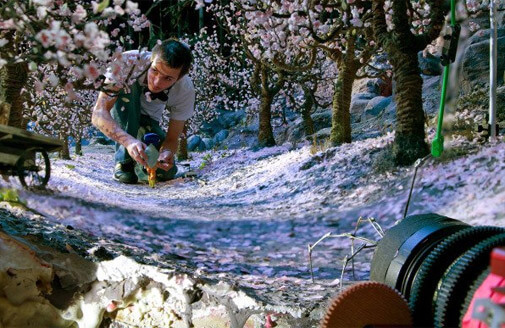 The clothing was hand-knit with tiny knitting needles and the cherry blossoms were hand-painted pieces of popcorn. The plot itself resembles that of the Wizard of Oz: quirky, yet easily bored Coraline finds magical world where nothing is at it seems; this world is wonderful and then scary, and Coraline realizes that there truly is no place like home. This new world is one of circus mice, decadent food, magic flowers, and dark secrets: a sort of Alice in Wonderland meets Beetlejuice meets Big Fish. Story-line aside, the technical brilliance and visual splendor make it worth watching again and again. This entry was posted in film and tagged coraline. Bookmark the permalink.